Should You Include 529 Plans in Your Benefits Offerings? Now is the time when many employers begin evaluating their benefits offerings in anticipation of open enrollment. In today’s competitive job market, benefits play an important role in attracting and maintaining employees. Offering a 529 plan to your employees through payroll direct deposit can be a great addition to a comprehensive benefits package. You can offer access to a 529 plan through payroll direct deposit at no cost. For as little as $15 per pay period, your employees can save for their children’s and grandchildren’s future education. They can even save for their own re-training and career development. In many states, onsite support is also available, making it even easier for employers to incorporate college savings in their financial wellness programs and benefit offerings. The convenience of payroll is evident as more employees are opting to establish payroll direct deposit into their 529 accounts, making small contributions with each payroll cycle. 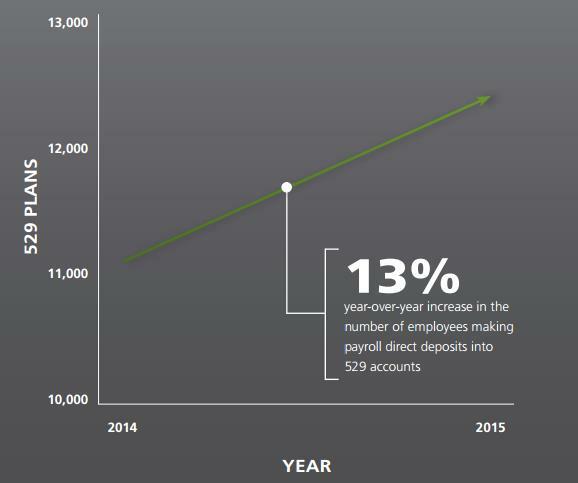 In our most recent college savings trends report, we saw a 13% year-over-year increase in the number of employees making payroll direct deposits into 529 accounts.1 This approach can make the 529 investment process automatic, simple, and easier to manage over time. Getting your questions answered is as easy as emailing us at 529employer@ascensus.com. Our team can help you make a plan to get a competitive edge. 1Ascensus College Savings Platform, as of December 31, 2016. We will send you a link to this page so you can access and review it when you are able to. For more information about 529 plans managed or administered by Ascensus call 1.877.529.2980 or click here. Investment objectives, risks, charges, expenses, and other important information are included in a 529 plan's offering statement; read and consider it carefully before investing. When you invest in a 529 plan you are purchasing municipal securities whose value will vary with market conditions. Investment returns are not guaranteed, and you could lose money by investing in a 529 plan. Account owners assume all investment risks as well as responsibility for any federal and state tax consequences.